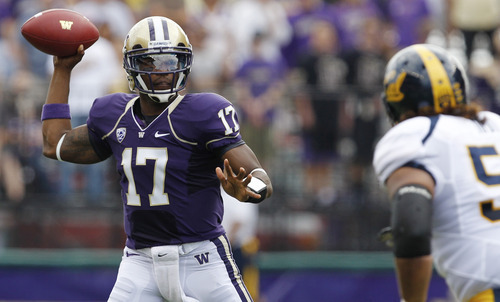 Rising fast • Overlooked as a prep QB, Keith Price is making a name for himself at Washington. Ask most talented quarterbacks at big-name college programs whether they felt under-recruited coming out of high school and, as a result, have something to prove during the next stage of their athletic careers, and the majority will softly deflect the question or respond with a fluff answer. The past is the past, they're taught to say at the next level, and all that matters is the team they're on now. Don't look back. Don't think twice. Washington's Keith Price doesn't abide by those rules. The 6-foot-1, 195-pound sophomore quarterback, who is tied for No. 1 in the nation in passing touchdowns with 14, acknowledged Monday that old wounds still matter in his new world. While Price starred at St. John Bosco in Bellflower, Calif., USC quarterback Matt Barkley soaked up every ounce of national attention from college coaches and recruiters as he shined brighter at nearby Mater Dei in Santa Ana, Calif. Barkley was awarded everything from Gatorade National Football Player of the Year to most valuable player of the Under Armour All-American game. Price? The No. 126 player in the West by superprep.com, the No. 80 prospect in California by a regional newspaper, the No. 50 quarterback in the nation by scout.com. Barkley was soon off to USC heaven, while Price's name bounced around recruiting lists at schools as diverse as Oregon, Nevada, Arizona State and Utah before he finally ended up in Seattle with ex-Trojans coach Steve Sarkisian. Three years later, Price still feels ignored. "Definitely," he said. "Just hearing this, hearing that, and people coming up to me. It was just funny. People hadn't really seen me; people were trying to judge me." He added: "I kind of like flying under the radar." That's not possible anymore. Price has led the resurgent Huskies to a 3-1 start and an early tie for the Pac-12's North Division lead. 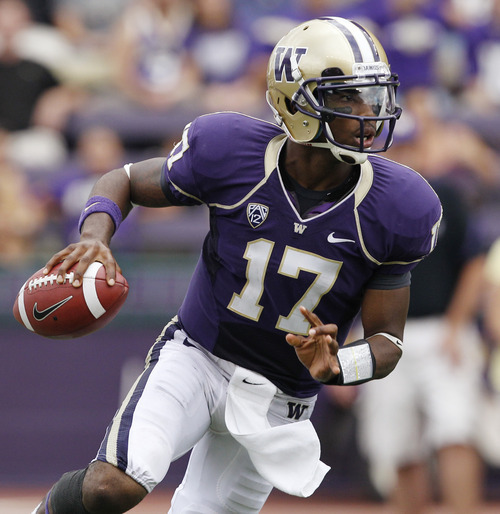 He has completed 75 of 112 passes for 983 yards, including a 19-of-25 outing for 292 yards and 3 TDs last Saturday during Washington's 31-23 comeback victory against California. "He's really improved from Year One to Year Two," Sarkisian said. "Did I think he would be leading the country in touchdown passes after four games? Probably not. But I also did think he'd play well. I don't think we would have made him our starter if we didn't think he was going to play well." Price has performed at such a high level, in fact, that he's making waves on two fronts. The QB that national recruiting systems severely undersold is teaming with Huskies running back Chris Polk  who has recorded two consecutive seasons of more than 1,100 rushing yards  to form the new face of Washington's revamped football program. Moreover, Price has turned college coaches' ambivalence into a trampoline, bouncing himself into a tradition-rich line of Husky quarterbacks that includes Warren Moon, Mark Brunell, Damon Huard and Jake Locker  players that eventually traded their purple-and-gold uniforms for NFL paychecks. "People ask me all the time, 'Are you surprised with how he's doing?' And to be honest with you, I'm not one bit surprised," said Washington senior linebacker Cort Dennison, who starred at Judge Memorial High School. "I knew all along how good Keith Price was going to be, so I'm not surprised by anything. The kid's just a great quarterback, great football player and a great person." Washington's road opponent Saturday was equally complimentary. Utah coach Kyle Whittingham acknowledged that he "lost track" of Price after the Utes briefly flirted with the idea of bringing him to Salt Lake City. 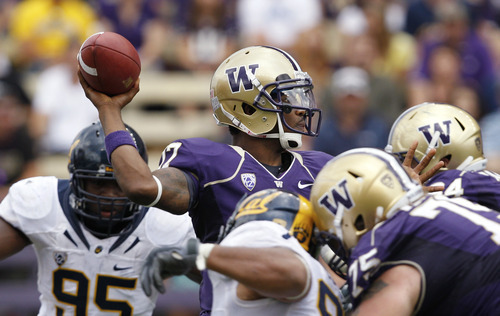 Tuesday, Whittingham ran through Price's attributes as if Washington's No. 17 was wearing Utah's No. 3. Not only is the highly efficient Price an outstanding playmaker who excels in turning off-rhythm situations into sudden advantages, but he's allowed a Washington program that should be limping after Locker was selected No. 8 overall by Tennessee during the 2011 NFL Draft to stay on track. Junior defensive tackle Star Lotulelei said that the Utes must maintain their lanes and keep a team-oriented focus on the field to contain Price, who was a dual threat in high school. Meanwhile, all Whittingham could do was pay respect to the once-overlooked talent that again has Washington barking near the top of the Pac-12. "We're watching all last year's tapes and all this year's tapes, and they haven't missed a beat," Whittingham said. Paying off • Price put up Jake Locker-type numbers last Saturday for Washington, completing 19 of 25 passes for 292 yards and three touchdowns during the Huskies' 31-23 come-from-behind home victory against California.